One of the highest traffic flow, most susceptible areas for wear damage in your home are the hallways, entryways and stairs within your home. Because a definitive traffic pattern exists, you’ll want to choose flooring that’s designed for heavy use, especially if the flooring is accessible to outside entryways. For your main entry, you will also want flooring that makes a dramatic entrance, warm and inviting to all that enter. Not sure what type of flooring is best? Here are a few ideas. For high traffic hallways and stairs, a low profile carpet can add more life expectancy. Choose pulled down nylon or loop construction for durability. Also select a high quality padding to increase the wearability. Carpet also offers slip resistance, which makes it an excellent choice for stairs. If you choose to have wood throughout your home, and want the sleek lines to carry upstairs as well, you can consider carpet runners for added protection in high traffic areas, and to add color and personality in different parts of your home. A secured runner on the stairs can add safety, especially in homes with small children or elderly. Hardwood is one of the most popular materials used throughout the Front Range, and with good reason. Hardwood is durable, hides potential dents and scratches, and can hide dirt and debris easier than other types of flooring, depending on the color. When choosing hardwood, you’ll have to decide between solid or engineered hardwood. While both are made from 100 percent wood, solid wood is more susceptible to damage from excessive moisture. Engineered woods are constructed to allow planks to grow and contract with environmental changes, so they make great floors in entryways that lead to the outdoors. Mats with rubber backs are not recommended as they restrict the hardwood floor from breathing. Laminate gives you the look of real hardwood in an easier to maintain, lower cost method. The biggest advantage of laminate is its finishes, which are extremely resistant to fading, scratching and scuffing. Laminate flooring is also easier to install, which can be a bonus to do it yourselves. Because laminates come with a click and lock plan installation, they can be tricky for stairs. Some manufacturers offer a one piece laminate stair tread option. One of the most durable flooring options in high traffic areas is tile. Today’s ceramic tiles include large selections of colors, styles, sizes and patterns, and can create unlimited possibilities when piecing together patterns and designs. Tiles are easy to clean and maintain, but grout may need periodic cleaning and sealing to keep it looking fresh and new. For an upgraded appearance, natural stone offers a sophisticated look that can add ambiance to any home environment. Consider slate, marble, granite, travertine or limestone, which can help you create a luxurious look anywhere. 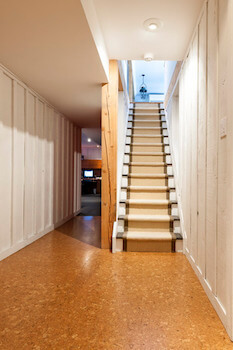 Need additional guidance to make the right choice for your hallways and stairs? Stop by today and see all the many options available that can make your home unique.